The SU-100 is a Rank IV Soviet tank destroyer with a battle rating of 6.3. It was one of the first vehicles introduced in the opening of "Ground Forces" in Update 1.41. Featuring the 100 mm gun with a strengthened design from the SU-85, the SU-100 can prove a menace to anyone on the other end of its gun. 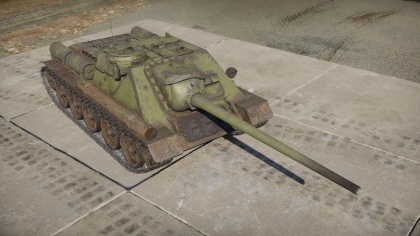 The SU-100 is a classical casemate tank destroyer and as such has a fixed forward gun for its main armament, not too unlike the SU-85(M) tank destroyers. This gives the SU-100 a preference towards a defensive play style than an offensive one. As such, it is best to play the SU-100 in a supporting role, firing at distant enemies and ambushing them rather than facing them head-on. The SU-100 boasts high firepower and long effective range due to its 100 mm armament. The gun is able to penetrate armour similar to the 122 mm on the IS-2, but also a faster reload rate while retaining a suitable post-penetration damage to devastate enemy tanks. As such, the SU-100 can lay in wait hidden in an open field and confidently attack enemies up to 1000 meters away. The SU-100 does not look very different from the Rank III SU-85M tank destroyer, the only big external difference is the large 100 mm D-10S gun extending from the body, significantly bigger than the 85 mm D-5S gun. Though external difference is minimal, the performance in-game is big enough for a whole rank. The 100 mm gun boasts penetration levels along the line of the 122 mm, but with a much faster muzzle velocity and reload speed. Aside from that, everything else is the same from the SU-85M. Gun elevation and depression is the same with +20°/-3°. The armour on the SU-100 is 75 mm sloped frontal armour. The engine and weight is also the same. With all these similarities, those familiar with the SU-85 series will feel at home with the SU-100, with the exception that a majority of the enemies in the BR bracket can effortlessly knock out the SU-100 with even a glancing shot. Driver's hatch maximum effective armour is 120 mm. The SU-100, as a Rank IV vehicle with a battle rating of 6.3, can be effortlessly defeated by a majority of the enemies faced at the BR bracket. As such, it is most important that the SU-100 makes the first, damaging shot before the enemy could get a shot first. 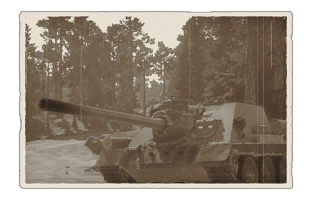 Panther A,G,F: Though the Panther's 75 mm gun can penetrate the SU-100's front armour with little difficulty, the 100 mm gun can penetrate the Panther's front glacis plate at quite a distance (>500m). Thus, getting the first shot off will turn the battle situation towards the SU-100's advantage. Tiger (P) and (H): The front glacis of the Tiger II is impervious to the 100 mm, but the turret cheeks are still a major weak point that the gun can easily penetrate. At closer range, the lower glacis is also a weak point on the front area. 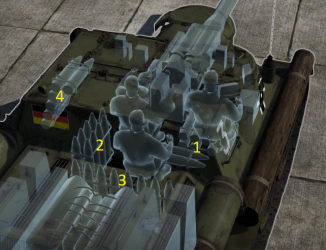 If the Tiger II decides to traverse its turret slightly away from towards the SU-100, the 100 mm also has enough power to penetrate through the Tiger II turret side rather easily. IS-2 (1944): The IS-2 is easily disposable by a good firing on the front glacis, though the 1944 version requires careful aiming on the front glacis, thus it is better to aim at the lower glacis for an easier time at penetrating. The turret cheeks are also easy to penetrate like other heavy tanks. This tank destroyer takes its lineage from its predecessor SU-85. The SU-85's introduction with its 85 mm D-5 cannon made it a lethal weapon against German tanks, giving it a much better firepower than the current T-34 with the 76.2 mm F-34 guns. However, the SU-85 became redundant when the T-34 began to upgrade into the T-34-85, which contains the same 85 mm gun as the SU-85. No longer having the advantage in firepower, the SU-85 was discontinued, but the role of a self-propelled gun was still required to support the armored forces. It was decided to upgun the SU-85 model with a much bigger cannon. Lev I. Gorlitsky, chief designer of Soviet medium self-propelled guns, began the development of improving the SU-85. It was decided that the new cannon will be of 100 mm in caliber, and work started on developing the prototype in February 1944. In March, the prototype named "Object 138" was made for testing, mainly by trying many different 100 mm guns to see which would prove most effective. It was decided that the 100 mm D-10 gun produced by Fyodor F. Petrov's design bureau, which was an adapted S-34 naval gun, was to be used as the main armament of the self-propelled gun, now named the SU-100. While the vehicle is essentially a SU-85 reworked to mount the larger 100 mm cannon, the SU-100 body has some major improvements compared to its predecessor. Armor on the front is increased from the regular 45 mm to 75 mm, the commander's workplace was enlarged into a small sponson on the right side of the hull with a commander's cupola, which increased his combat effectiveness. Two new ventilator units were also installed for increased ventilation of the gun's propellant gases. Production started in September 1944 and continued until some time in 1947 with a total of 2,335 units produced. In its introduction in the last few months of World War II, the SU-100 proved to be a very successful tank destroyer. The 100 mm D-10 gun could penetrate 125 mm of armor at 2,000 meters away, against the Panther, it could take it out from 1,500 meters away easily. Most of the SU-100 in service saw action in Hungary in March 1945, most notably in the German offensive Operation Frühlingserwachen (Spring Awakening). Although never intended for infantry support, the SU-100 even saw action in the Battle of Berlin in the close-quarters combat of urban warfare as its 100 mm gun was very good against heavy fortifications, but the lack of any machine guns has the vehicle work in cohesion with infantry or aircraft. After World War II, the Red Army retained the SU-100 for a few more years until retiring them to reserves in 1947, still existing to this day. The SU-100 were given out to Warsaw Pact allies such as Egypt, Angola, Cuba, China, and Czechoslovakia. The SU-100 saw service in many Cold-War conflicts such as the Korean War in 1950, Vietnam War in 1955, Suez Crisis in 1956, Six-Day War in 1967 and Yom Kippur War in 1973. Some were modified to adapt to the sandy environment of the Middle East, these were designated the SU-100M. These exported SU-100s continue to see service up to today in some countries, but most replaced it by 1970s. One of the most recent usage of the SU-100 is in Yemen during Yemen Civil War of 2015. This page was last edited on 11 January 2019, at 22:17.